Etheldred Dryden Newbern was a pioneer settler of Berrien County and a noted participant in the last Indian encounters in Berrien County (see Martha Guthrie: Babe of the Indian Wars). Monument for Etheldred Dryden Newbern, buried at Wayfare Church Cemetery near Statenville, GA. Newbern was one of the pioneer settlers of Berrien County. The Newbern’s homestead was located on the east bank of Five Mile Creek, perhaps about eight miles northeast of Ray City. This was probably somewhere in the present day vicinity of the Highway 168 bridge over Five Mile Creek. …the women ran through the field , a back way, a distance of five miles to the home of Dread Newborn. Arriving there she related what she had seen, as fast as her fright and exhaustion would allow, for she had run every step of the way, and she was almost overcome with heat and fatigue. On learning this Mr. Newbern realized that the cause of their own experiences of the night before when the horses had become greatly frightened, snorting and breaking out of the horse lot and coming back the next morning. It was supposed that they had become frightened at the sight of the Indians who were prowling around the neighborhood to steal. A company of men soon collected together, under the command of George Peterson, Dread Newborn, William Parker, and others. 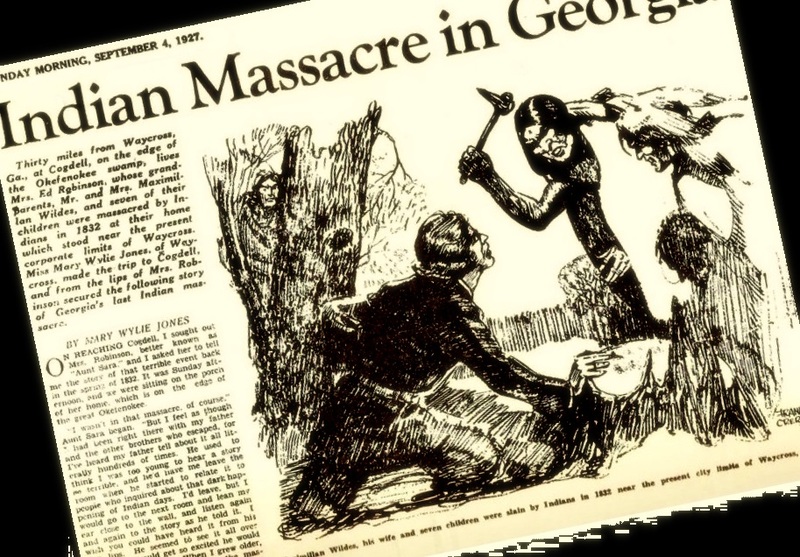 The Indians were overtaken at the Allapaha river and three were killed, others made their escape but were overtaken at the St. Illa river [Satilla], at what is now known as Indian Lake, about two miles northeast of the town of Axson, Ga. They were all shot and killed, except one squaw; it was reported that she was captured and shot. Dread Newborn, the son of Dread Newborn, who followed the Indians, informs me that the Indian woman was kept in prison for a while and then by direction of the government was returned to her own people. Etheldred Dryden Newbern, called Dryden or Dred by some, was born 1794 in South Carolina. He was the eldest son of Thomas Newbern. Folks Huxford said the name of Dryden’s mother was not known, but some Internet genealogies indicate she was Nancy Christian. Dryden’s grandfather, also called Thomas Newbern, was a revolutionary soldier. About 1798 Dryden’s father, Thomas Newbern, brought the family from South Carolina to Georgia, Thomas Newbern served as a lieutenant and captain in the Bulloch County militia. Dryden’s mother died about 1803 when he was a boy, probably nine or ten years of age. His father, a widower with seven young children, quickly remarried and Dryden was raised into manhood by his stepmother, Kizzie Collins. Some time prior to 1815, Thomas Newbern moved the family to Tatnall County, where he was elected Justice of the Peace. It is said that Dryden Newbern served in the War of 1812, although no documentation is known to exist other than the testimony of his son, Dred Newbern. Dryden would have been 18 years old at the time the war broke out, and considering the military legacy of his father and grandfather, his service in the Georgia Militia seems reasonable. In 1814, the British forces occupied St. Marys, GA, which would have disrupted the economy of the entire region. 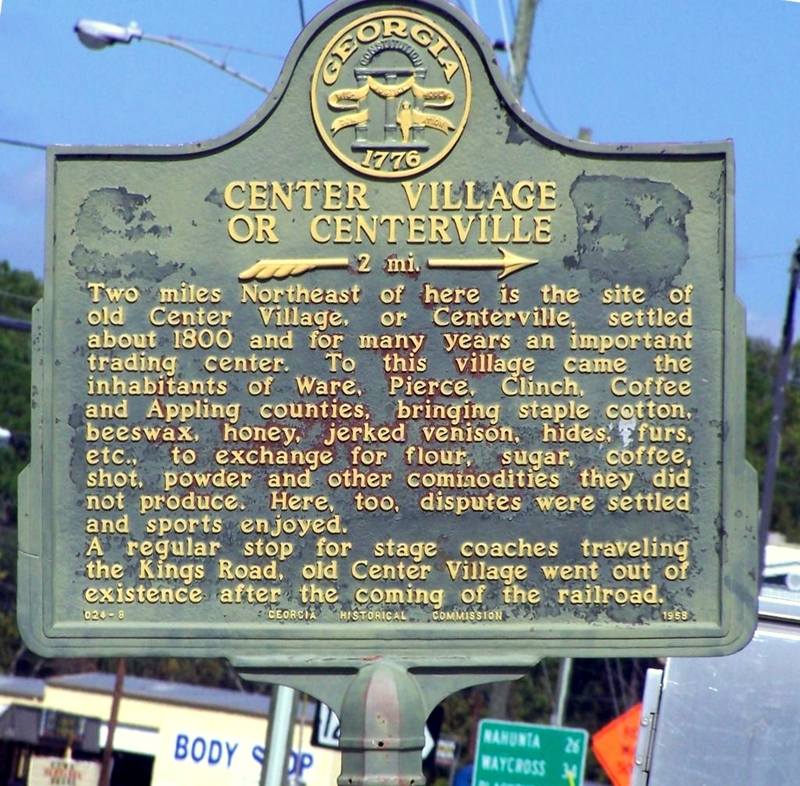 The British occupation certainly interrupted trade on the Alachua Trail which ran from the Altamaha River through Centerville, GA, then across the St. Marys River and into East Florida. The resistance of the Georgia Militia against the British and St. Marys and other coastal Georgia incursions is described in the New Georgia Encyclopedia article on the War of 1812. OF the Clinch County Newberns, Thomas Newbern was the progenitor. This old pioneer came to this section from South Carolina and settled in what is now Ware County, about 1820. He was married twice. By his first marriage he had three children, viz. : John, William C, and Dryden Newbern. By his second marriage he had five children, viz. : George W. Newbern ; Cassie, who first married Martin Nettles and later Chas. A. Griffis; Lucretia, who married Jack Lee ; also a daughter who married James Sweat, and one who married John Sweat. Thomas Newbern was a prominent citizen of his time. He was elected surveyor of Ware County and commissioned February nth, 1828. Two years later he was elected a justice of the Inferior Court of Ware County, to which he was commissioned April 28th, 1830. He was also commissioned justice of the peace of the 451 district of Ware County, April 3d, 1833. He is the fore-father of many of Clinch’s prominent citizens. After their marriage in 1823, it appear that Betsy and Dryden Newbern for a time made their home in Appling County, near the homestead of Dryden’s parents. In 1825, their farms were cut into Ware County into the 584th Georgia Militia District. From 1825 to 1827 Dryden Newbern served as the First Lieutenant of the militia in the 584th district. About 1828, Betsy and Dryden moved their young family to Lowndes County (now Berrien) to a site on Five Mile Creek. They established a homestead about seven or eight miles northeast of the home of Levi J. Knight, who had settled a few years earlier on Beaver Dam Creek at the site of present day Ray City, GA. In Lowndes County, Dryden was elected First Lieutenant of the militia in the 664th district. Levi J. Knight was the Justice of the Peace in this district. At that time the land was still unsettled , and the Native Americans who had occupied the territory for so long in advance of white settlers were being driven out of their ancestral lands. As Wiregrass historian Montgomery Folsom said, ” The Indians were goaded into madness.” When open conflict with the Indians emerged in 1836, Dryden Newbern was one of the first responders in the area. Sending out the alarm when the Parker place on the Alapaha River was raided, he was among the leaders in the skirmish that routed the Indians (see Short-Arm Bill Parker and the Last Indian Fight In Berrien County). 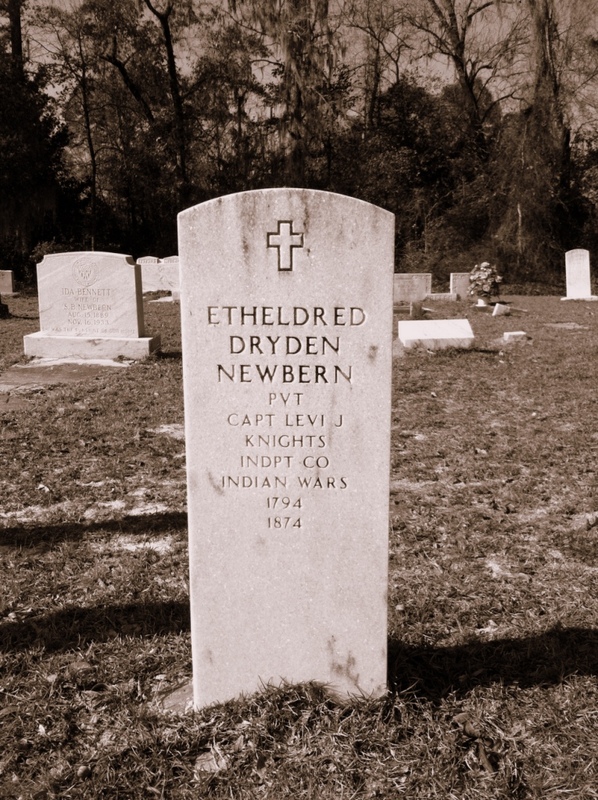 In the Indian Wars, Ethedred Dryden Newbern served as a private in Captain Levi J. Knights Independent Militia Company. Huxford says the land on Five Mile Creek where Betsy and Dryden Newbern established their Berrien County homestead later became the property of John Fender. The Newberns then acquired land a few miles to the east and moved there, making a home on the west side of the Alapaha River. About 1865 they sold this property, which later came into the hands of George N. Sutton, and moved east to Clinch County. They purchased Lot 256 in the 10th Land District and made their home there for several years. When their youngest daughter, Sarah “Sallie” Newbern, and and her husband, William Franklin Kirkland, moved to Echols County, the elderly Newberns moved with them. In Echols county, the Newberns purchased land and a herd of cattle; the late 1860s and early 1870s were a time of expansion in Georgia livestock production. In 1874 Etheldred Dryden Newbern suffered a “rupture” and died. He was buried in an unmarked grave at Wayfare Church, Echols county, GA. A monument has been placed in the cemetery in his memory. Benjamin Newbern (1824-1895) married Nancy Griffin, daughter of Noah H. Griffin. In the Civil War enlisted in 9th FL Regiment. Burial at Wayfare Church Cemetery. Thomas “Tom” Newbern (1828-1877) married Elizabeth Moore, daughter of John Moore. In the Civil War enlisted in Company G, 29th GA Regiment as a private in 1861. Caroline Newbern (1829-1891) married Edward Morris. 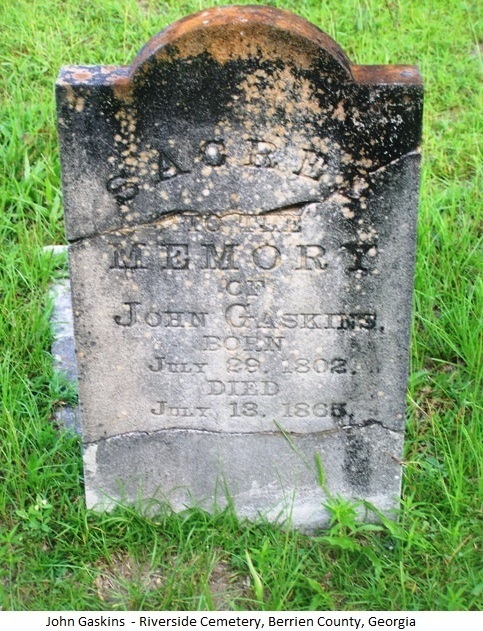 Burial at Arna Primitive Baptist Church Cemetery, Atkinson County, GA.
Joseph Newbern (1834 – ) married Emily Gaskins, daughter of John Gaskins. Martha Newbern (1836-1925) married Samuel Guthrie. Burial at Guthrie Cemetery, Berrien County, GA.
John Ashley Newbern (1839-1864) married Mrs. Sarah Ann Sirmans Gaskins, widow of John Elam Gaskins. In the Civil War joined Company H, 29th GA Regiment. Killed in action near Atlanta, GA in 1864. Burial at Arna Primitive Baptist Church Cemetery, Atkinson County, GA..
Etheldred Dred Newbern (1844-1933) married Wealthy Corbitt, daughter of Elisha Corbitt. In the Civil War enlisted in Company I, 50th GA Regiment. Burial at Arna Primitive Baptist Church Cemetery, Atkinson County, GA..
Berrien A. Newbern (1845-1863) never married. In the Civil War enlisted in Company H, 29th GA Regiment. Died of wounds received in battle in Benton, MS on 26 June 1863. Burial at Arna Primitive Baptist Church Cemetery, Atkinson County, GA.
Sarah “Sallie” Newbern (1848-1921), born November 7, 1849; married William Franklin Kirkland. Died July 13, 1921. Burial at North Cemetery, Dupont, Clinch County, GA.